Safety shields are designed from clear acrylic or polycarbonate materials with thicknesses ranging from 1/8” to 1/4". The shields are designed to provide protection without inhibiting vision or access to the work area. Both materials have excellent clarity, weight, and durability. 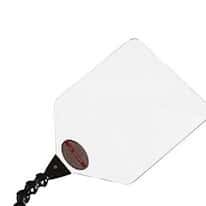 Shields are available in square and rectangular sheets with sizes up to 15” wide. Mounting option includes an articulated neck type clamp that is excellent for low cost light weight shields and provide universal positioning possibilities. For larger and heavier shields, twin bracket clamp models provide the strength and stability needed without compromising adjustability.